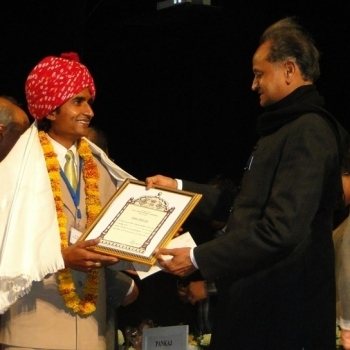 In 2009, Om Prakash Galav got the “State Merit Award 2006-07” by RAJSICO, Govt of Rajasthan. For a 6.5 feet Artistic Hookah made by him. In 2010, Om Prakash Galav got the “State Merit Award 2008-09” by RAJSICO Govt of Rajasthan for a 5.5 feet Artistic embossed Hookah made by him. 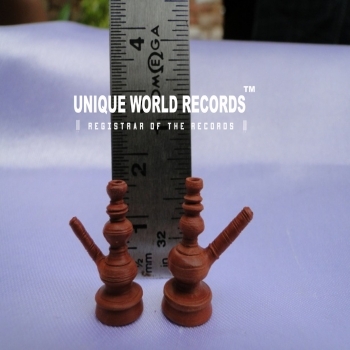 Holds a World Record of Most Smallest Miniatures of terracotta in 2014. They measures in between 1 mm to 5 cm made on a potter’s wheels and need a magnify glass to be seen. 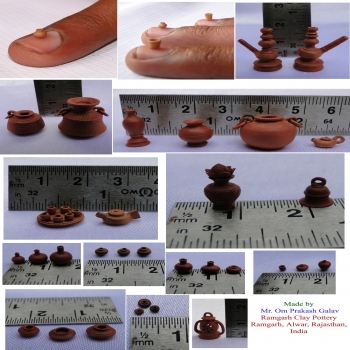 These miniature items including matka, tea-set, lantern, chain, bowl, kalash, hookah, stands, bell etc. Holds a World Record of Smallest Hookah made of Teracotta in 2012 & 2014. It measured 1.8 cm in height and 7.5 mm in diameter at the bottom made on a potter’s wheel. The tobacco heated in the bowl at the top of the hookah and smoke its filtered through the water in the base of the hookah. 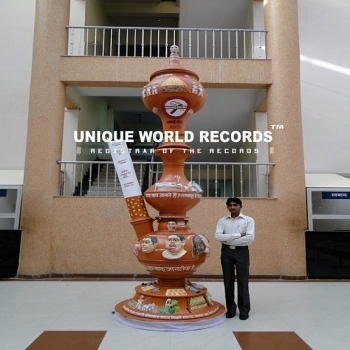 Holds a world record of Tallest hookah made of terracotta in 2012 & 2014. It measured 14 feet in height made on potters wheel with murals of hazard of tobacco use and abuse. It was unveiled and installed at Dhanvantari O.P.D. in Sawai Man Singh Hospital, Jaipur by hon’ble health minister of Rajasthan on 31st may 2011 (World No Tobacco Day) to create public awareness through terracotta art. The campaign organized by Ramgarh Clay Pottery with public collaboration. Ramgarh Clay Pottery enterprise is Located in Ramgarh District Alwar Rajasthan. It situated 140 Kms. From Delhi Via Sohna Road and 175 Kms From Jaipur. Ramgarh Clay Pottery is Cottage Industry and Registered with District Industry Center Alwar. Ramgarh Clay Pottery © 2014 All rights reserved | Powered by .